Therefore this relationship should be implemented in the microcontroller correctly in order to blend the correct angular velocity in the model dynamics. defect in it, a jumpy signal for instance, and I applied running average filter to smooth the curve. There is another sensor that is related to it but no conditioning was applied because it was good enough. In the end, after the relationship is applied, the resulting signal becomes worse than it would had been if I did not apply the filter to the defected sensor. This is because running average introduces signal delay. 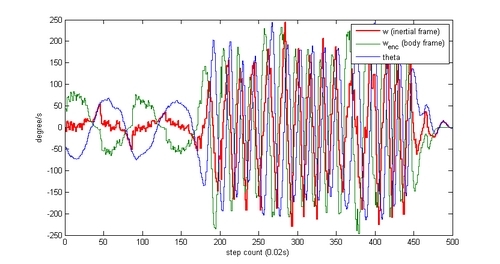 Therefore if I were to perform a running average filter to smooth the curve, I should do it not immediately to the data that are ill-conditioned but after the relationships with other data are applied. The following figure illustrates the data that was collected with the wheels fixed at one position and only the body swing back and forth. The first 170 steps were performed in a steady slow motion and afterward I applied fast motion to see the difference. The color green indicates angular rate deduced by the encoder, blue indicates Kalman filter rate of the body, The color red indicates $\omega$in inertial frame, and in this situation it should always be a constant 0. 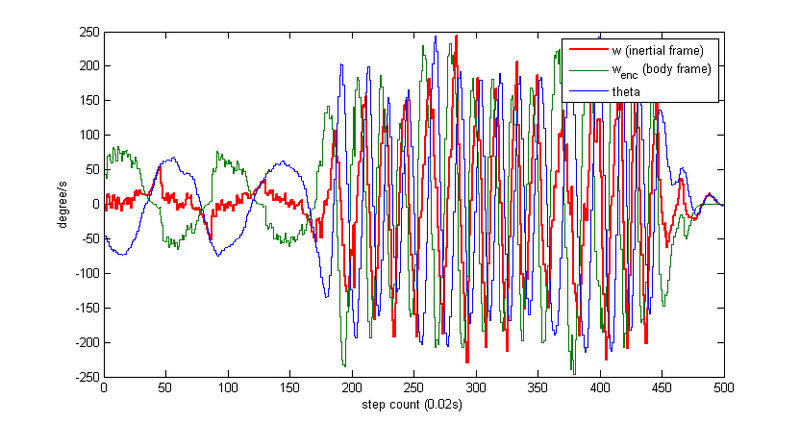 This shows that different sensor dynamics can introduce significant noise if not taken care of properly. My experience showed although running average algorithm works well for curve smoothing it introduces significant delay that in this kind of situation cannot be tolerated.